Raise your hand if you love a giveaway! I’m super excited to be taking part in the 2015 Holiday Gift Guide and Giveaway blog hop with some of my favorite bloggers. I did it last year too and had so much fun searching for gifts that hopefully helped give you guys some ideas of what to put on your list or what to buy for a friend. Here’s how it works. The hop started yesterday with 5 bloggers and 5 awesome gift guides. Each of those bloggers is giving away something from their guide and there will be 5 new ones each day this week. That means 25 awesome giveaways for you to enter. Pretty sweet right? 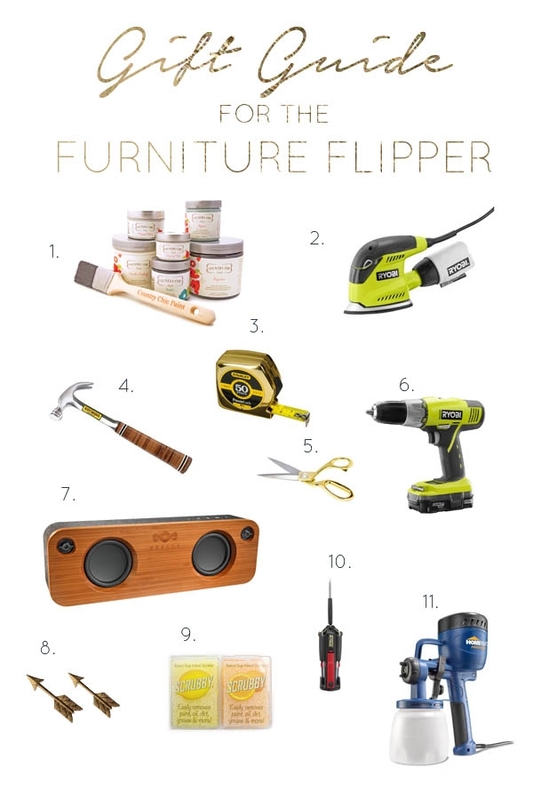 This year I decided to put together a little gift guide for the Furniture Flipper. After doing this for about 2 years, I’ve come to realize there are some must have items that I can’t live without and I wanted to share them with you. A sander is an absolute must. I don’t use it on every makeover, but when you have stubborn veneer you want to remove, this guy gets the job done. We’re besties. I need to attach one of these to my body somehow. I always lose mine. And how pretty is this gold one?? There’s always something that needs hammering. Trust me. A must have. Especially gold ones. I don’t own this…yet, but I need it. We don’t have a cordless drill and it’s always a pain having to make sure you’re near an outlet to use it. Friend’s of ours recently gave us these speakers as a gift and they are amazing. Sometimes working with no music is relaxing and peaceful, but jamming out is just as fun. Especially when you have a project that’s taking a while to finish. One of my favorite things about flipping furniture is the pretty new hardware. I was recently introduced to this stuff and will never use anything else. It gets literally anything off my hands and smells amazing. This is another thing I lose all. the. time. I need to buy like 10 of them and keep one in each room of the house. I recently discovered this one at Target and am obsessed. It has every head you need all attached to one body, and it has a little light to help you see into those dark nooks and crannies. I only started spraying some of my furniture recently, but it’s a total game changer. What a great list of gift ideas, Bre! I’m thinking I need to start doing more furniture makeovers — just for the cool toys. I’m getting ready to re-do my sons’ room after the first of the year and could use the paint to help with some projects in there. I would use it on my kitchen table. I have this garage sale dresser/cabinet that desperately needs a makeover! I’d love to try my hand at painting a bigger piece of furniture! I would love to refinish my old piano. This kit would be a great help! Fantastic gift guide, Bre! I still haven’t tried Country Chic Paint, but I’ve heard such great things about it! I have a pile of furniture in my garage that I would love to try it on! You must have read my mind! What an amazing collection of gifts, and that paint! so much to paint, so little time! 😉 Great list! I would redo a hand me down cedar chest. The veneer is shot so it could definitely use a makeover. This would be put to great use on my desk and chair for my home office. I’d use it to paint my coffee table. I am loving the things you selected for the furniture flipper, some I used often and some are now on my wish list! Such a fun giveaway! And the whole guide… really, I always admire your furniture flipping ways. I’d probably get working on a couple old dressers I have in my kiddos room. 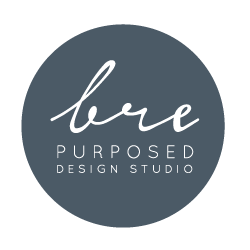 This is such a great Giveaway Bre – Country Chic Paint is one of my favorite chalk paint companies and I love how they are a Canadian company. LOVE those speakers! Fantastic Giveaway, Country chic is one of my favorite brands of paint. Awesome list, Bre! I love CCP and wouldn’t mind getting my hands on that package! I would paint my dining room table, chairs and hutch. I have a desk that could definitely need some help, so that would be my first project! Can you believe I’ve never used Country Chic paint?! Dying to try it! Great gift guide, Bre! And thanks for the giveaway! I LOVE CCP so I would definitely give a gorgeous piece of furniture a new look if I won! I would love to redo the two dressers in my bedroom. Oh, I am so excited. Kind of on purpose I spray painted my white tin cans to make snowman on my dining room table. Darn! Not really. Had already decided I was going to paint it and oh joy I have to. In between Thanksgiving and Christmas or Christmas and New Years. Table clothes hide a multitude of white circles on my table now. Aww, those speakers are amazing! I have so many furniture items that I want to paint, so winning your giveaway would be just the push I need to get started on them! I would stop putting off painting my china cabinet in my dining room. I have a fabulous flip-top table from Habitat Restore that I’m itching to paint. My desk that I STARTED painting would get finished! I would LOVE to try the paint! I just started getting into furniture flipping so I would love to win the starter package. I would really use it. I have a table that was my mom’s that I want to refinish and point it. I just started getting into furniture flipping so I would love to win the starter package. I would really use it. 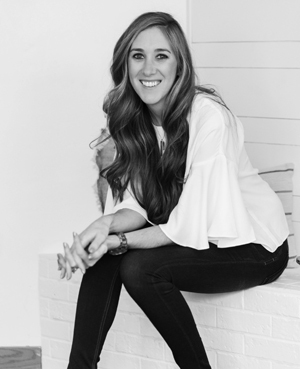 Bre, love your roundup! I totally could use that paint sprayer! Thanks for the giveaway! SUCH a great list and a fab giveaway – LOVE Country Chic Paint!!! I’ve got a ton of furniture that could use some Country Chic love! I have a sewing table that is in desperate need of refinishing. 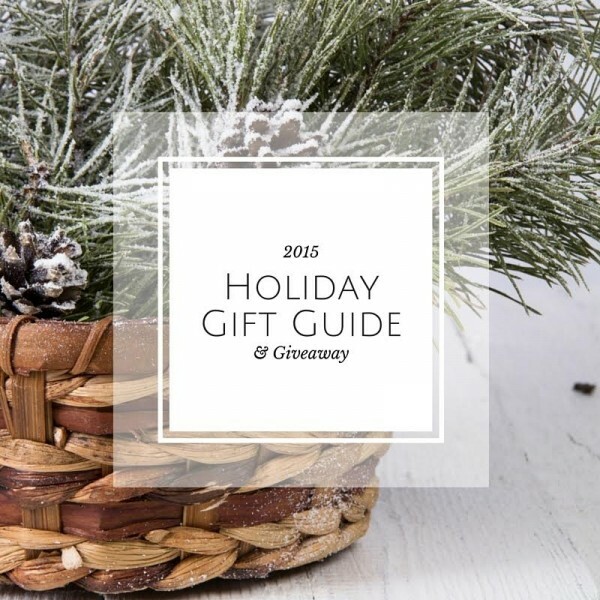 What a great giveaway and fabulous gift guide! I would probably repaint my living room side table. It desperately needs a new paint job! I have a dresser waiting for a makeover! That scrub set looks so interesting. I’m going to have to try it. Love the gift guide!!!! I would love to paint an old, sad table with the paint.